On a particularly stormy morning (Tuesday, Dec. 18th to be exact) here in Eugene, as the rain poured heavily and the strong wind whipped everything from side to side, I clung to my umbrella with both hands. Despite the fact that I managed to hold on to my umbrella and keep my head and upper body dry, my lower body was covered with rain drops. It occurred to me, as I stepped into the office, that this scenario very much reminded me of what is going on in the market at this time. To cap off a volatile year, Q4 turned out to be the most volatile quarter yet for equities. The stock market tested new lows for the year in December. As of December 18th, the S&P 500 was down 15% for the quarter-to-date (QTD) and down -5% for the year-to-date (YTD). The European debt crisis and concerns about lack of growth prospects in Asia drove international stocks to much lower levels as well, with the MSCI EAFE down -15% for the YTD as of December 18, 2018. Because we heeded many of the warning signs in the market and kept allocations to risky assets lower, Journey Tree portfolios for the most part fared much better than they otherwise would have in Q4. Despite this, we were not immune to participating in the losses endured by both bond and stock markets in 2018. 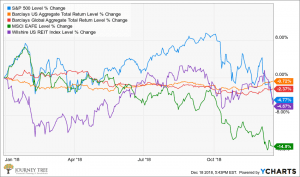 And while it is painful to tell investors that their negative portfolio performance is outperforming passive investments, which had even larger losses this year, that is in fact the case for many of our investments. We at Journey Tree encourage our clients to let these stormy markets be an opportunity to save more, add to your investments if possible (as some of you have been doing), and to take advantage of pockets of value that are resurfacing – in other words, grow stronger roots in order to be able to withstand any storm.